Tricia-Rennea has some cute Halloween themed printables to download. I love her colouring pages but I would use them for stitcheries...very cute...take a look. Make It has a simple Circle Quilt tutorial to create a really effective quilt. I always avoid patchwork circles but this is easy and effective. Nancy-Rose has a tutorial showing us how to make a scrappy quilt with snowball blocks and nine patch blocks to use up all those old shirts you have or find at the op shop. What a nifty idea Nancy-Rose. Thanks for the great tutorial. Moda Bakeshop has a really cute tote with pockets all the way around it and a cute little coin quilt to go with it. I love this tote though. 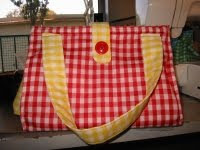 You will find a different style of picnic bag over at SewTakeAHike. I really like this idea for a completely different style of carry bag for all your picnic goodies. Some more cute ways to use up those odd buttons can be found over at Martha Stewarts. This button wreath is another cute way to use up all those odd buttons and something the kids can make. 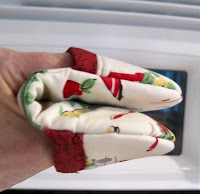 Shirley from Bits and Pieces has a nice easy tutorial to make some fingertip oven mitts. Go take a look. I like this idea...not too big and bulky for me. 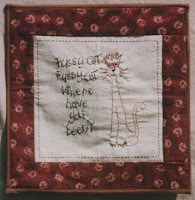 Warm Heat has a cute stitchery called Pussycat Pussycat Where Have You Been to grab. How cute!! What a cute idea for the girls to make bracelets with all those hundreds of buttons I seem to be accumulating. I can never find a pair out of them....so this is a great idea that Indigo Blue has. I know its nothing new and I have seen them before, but I needed reminding. 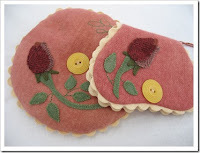 The Quilted Crow Girls has a lovely felt pincushion and needlecase that opens out into the shape of a butterfly. Gosh I spent ages looking for a Birthday background....how hard could it be? Very hard it seems...lol...truly, I didn't think I would find one. But, finally I found one. Yes just one at Scrap E-Blog. Amy over at During Quiet Time also has a cute Bunny Bag pattern to whip up. Thanks Amy for sharing your patterns with us. Now this has to be a must for your budding artist. Amy from During Quite Time has instructions on how to make this. This crayon apron would be a terrific gift for your little girl who loves to draw. Amy from During Quiet Time has a great tutorial using selvages edges to make a scrappy armrest for us sewers/crafters....ohhh boy I can't wait to try this one. I have been saving my selvage edges for something and I think this is it. 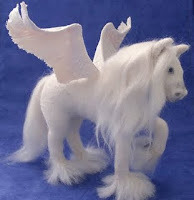 Sharon has an amazing freebie over at House of Pugish.....a brilliant Unicorn pattern. You have to snap this one up if you are into this kind of thing. Please don't forget to leave a comment and say thank you to the people who share their patterns with us. Cheryl Goss has given us a lovely stitchery wall hanging called Seasons Greetings. Thanks for sharing with us all Cheryl. Karen's Whimsy has some really lovely Christmas clipart along with a lot of other clipart to use for your projects. 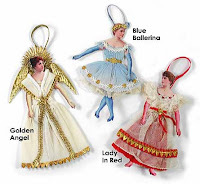 Print off these cute Victorian Lady Ornaments and then dress the in your favourite laces, ribbons and trims to suit your tastes. There are some other style of Christmas tags to print off here, here, and here too. The cutest little knitted Christmas stocking pattern can be found over at Little Cotton Rabbits....she has a lot more over there too so take a look around. Elizabeth Carroll has a bag pattern called Diana Hobo Bag to download. Another definite to try out. 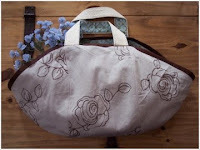 The Giving Flower has a down-loadable tutorial for a purse organiser. Now when you want to change handbags you just need to pull your organiser out and all your goodies will just pop into the new handbag....wahhh laahhh...what a great idea. Kara has a gingham purse/hand bag tutorial to share. This would be a great carry all for all our sewing projects too I think. Free Amigurumi Pattern Blog is all about just that....Jane is on the hunt for free amigurumi patterns so go have a look at what she has found. Coats and Clark have the cutest little owl pattern to crochet....just sooooo hooty cute. The Chocolate Crow Trader is an Aussie site with many sellers coming together to sell their wares. But on top of that they have lots of free patterns. Some terrific prim patterns I just love. Stitchery, dolls, Halloween, Christmas...all sorts. Junie Moon has a small book with natural cleaning recipes that is available to download. So for all you out there that like to use natural recipes or always wanted to try natural cleaning recipes for cleaning, now is a great chance to grab it. 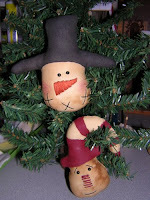 Annies Cupboards has some cute Christmas Ornies to make....you can prim them up as much as you like. 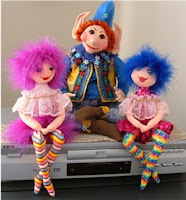 Judith Prior has a couple of free patterns if you want to make a doll, gecko or clown. Fancy Nancy is rather cute. Lisa from Button Bliss has more Christmas stitchery patterns up to grab. These really are sweet and will make lovely ornaments or just use them on any of your Christmas goodies. Lisa also has cute quotes to use on your projects and some instructions on how to use paint or water pencils to colour in your stitcheries. 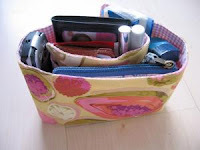 The Sewing Republic has lots of different tutorials but I really like the Supply Case. Take a look around and see what else you might like....let me know if you do find something and make it up. Noodlehead has a tutorial for a zippy wallet. This is another must try I think. Thimbleanna has a tutorial for what she calls a "purse thingy". 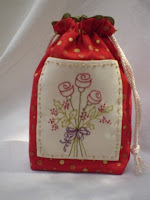 Judith is sharing a lovely drawstring bag with a rose stitchery on it that looks nice and easy to whip up for Christmas. Thanks Judith. 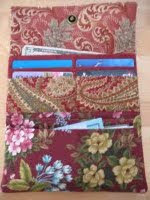 Talin from Talins Corner has a nice simple wallet to make. No zippers to worry about either...lol...not that I am concerned as I am getting good at putting zippers in these days. 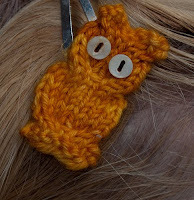 Take a look at this cute owl clip over at Ysolda's...its knitted and then a hair clip is attached. Hooty coot indeed. 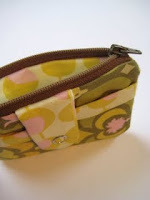 Sew Christine has a tutorial for a little coin wallet with a zipper in it. Great for a quick get-away....it has an attachment for a metal clasp you can clip it to the inside of your handbag.